I remember the day my mom started buying the groceries in a “normal” store. We had always sourced our food from family and from other farmers in the area, but then we moved. As a kindergartener I argued with my mom that eggs, meat and veggies tasted wrong. We grew a garden and harvested it. I would wonder, “Why does this tomato taste so good?” Moving to Delaware working in the natural food industry I realized the answer. Locally sourced food has less travel time, more nutrition and flavor. Talking to farmers I found out how animals were raised, treated, and fed. I knew how they grew their veggies and harvested with love. My grandfather, a farmer, was a huge inspiration to me. I am the first generation to be removed from our family farm. Honestly, I don’t know the first thing about farming. I love my hands in the dirt and love that I can go to local farms on Mondays and gather safe, real food for my café. Every week I learn a little more and sometimes it is just the peace that overcomes me walking a row of delicious veggies in a wide-open field that serves as my reward. 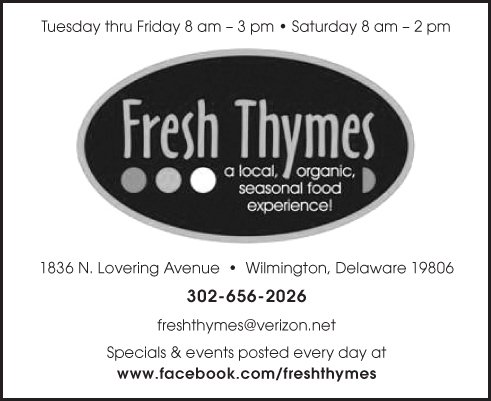 Fresh Thymes, a quaint cafe nestled near Trolley Square in Wilmington, DE provides a local, organic, and seasonal food experience. It is operated by a passionate mother-daughter team who provide nutritious food made with lots of love. We also provide gluten-free, vegan, vegetarian, and omnivore options. We look forward to meeting you soon! More information can be found at www.facebook.com/freshthymes. Jenn Adams is originally from Illinois and grew up in a farming family. She understands the importance of supporting local farms. 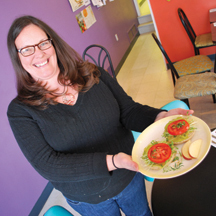 Her mission is to educate and provide quality local and organic food for the community.